One of the suggested themes for the quilt squares to be made by volunteers who were at the Best Friends hurricane relief center in Tylertown, Mississippi, (see previous post) is "How I got to Tylertown." One of the disturbing images in the media after Hurricane Katrina was of a boxer-type dog trapped in a house, peering out a window. In a previous post, I mentioned that these images were so upsetting, that I had to take action and go volunteer. So, to show "how I got to Tylertown," I've depicted a boxer with a mournful expression in a window, but one with an Indian fabric curtain. The dog was my inspiration for going, and the Indian curtain represents how I was able to make the trip--with money made by selling Indian textiles. Hokey, I know. When I was at the Best Friends hurricane relief center in Tylertown, Mississippi, last December, there were two timid little female dogs in the clinic who received their regular walks from a couple from Virginia. The dogs were inseparable and were dubbed "Yin" and "Yang." I received a call from Whitney at Best Friends in Kanab. She wanted to check on the dogs we are fostering for BF [Best Friends]. We have adopted them now. Whitney had been volunteering in New Orleans after Hurricane Katrina. Her group kept hearing about puppies at the oil refinery in Plaqmines Parish. After getting permission to go into the area, they then received permission to go into the refinery by the workmen there. A rooftop from some nearby building was on the ground. Underneath that roof, the group found Thelma and Louise with 14 puppies. According to the workmen, Louise (our little yellow lab mix) is Thelma's (our black dobie mix) mother. The workmen have a dobie mix male on the premises who is Thelma's dad. I don't know who the puppies' dad is. Thelma and Louise were strays and hung out at the refinery and the people there would feed them. I think that is about all they did because they were so fearful of people. The group received permission to take the girls and their puppies. The puppies went out to various shelters and Thelma and Louise went to BF in Tylertown. It now makes sense that they were so close to each other...mom was protecting her daughter. They have fit into our pack so well and are great girls. I am so glad they are officially ours now. I want to make a quilt square about Annie, or my favorite dogs from my first visit, but I started with this design because it was such an obvious (and quick) one. In the spirit of the last post, I am going to start writing more about non-U.S animal welfare organizations. Although I have sent donations to Best Friends and other U.S. animal welfare organizations, my main goal has always been to raise money for non-U.S. ones, in India and elsewhere. When I see that the CEOs of the big U.S. organizations make 10 times what I do, I feel as though my measly $200 donation isn’t going to go very far in this country. According to The Welfare of Stray Dogs, it costs about $12 to sterilize a stray dog in Mumbai , India . For $200, one could pay for the sterilization of at least 16 street dogs. Left unsterilized, these dogs could produce tens of thousands of puppies within the period of a few years. And, those dogs would have miserable lives, filled with hunger, disease, and injury. According to the Animal Aid Society, a street dog in Rajasthan has an average life span of 15 months. A recent New York Times article on Warren Buffett’s gift to the Gates Foundation led me to the following statistic: According to Geneva Global, less than 6.5 percent of American charity goes overseas. On the Best Friends website, there are various “networks” that one can belong to, depending on your interests. I belong to three: International Friends, Massachusetts Friends, and Hurricane Katrina. The last one, people wanting to communicate and keep up-to-date on news surrounding animals affected by Hurricane Katrina, has 194 members. There are 60 people in the Massachusetts community and just 41 in the International network. A news report in the Vermont network about an animal shelter struggling to stay open due to financial difficulties received comments from 13 people stating that they were sending a donation. There was a news story a few months earlier about a couple who opened (with their own money) Iran ’s first and only animal rescue center. The couple recently had to flee Iran , leaving the shelter and their pet dogs behind. The article was a plea for financial assistance (easily made with U.S. dollars through PayPal). Rather than offers of help, here is the typical comment left by readers of that article: "How very sad. Even with all our problems, I am so glad I live in the good old USA . I hope she finds help for all her animals." I’ve always wondered about this seeming lack of interest for non-American animals. But, I guess it applies to all types of giving. At the Volunteer Association for the Protection and Care of Animals, in Tijuana , Mexico, (mentioned in the previous post) $30 can feed a large dog for a month. In India, it will provide rabies vaccinations for 50 dogs. With $18, Romania Animal Rescue can spay/neuter/vaccinate and give 5 recovery days to a stray street dog at their shelter. For many foreign organizations, donations can be made using PayPal or checks in U.S. dollars can be sent to a U.S. affiliate, so complications of currency exchange is not an excuse. However, organizations such as Best Friends and Humane Society of the United States do help out foreign organizations, so U.S. donations to those organizations do make it abroad. It's just not very efficient; more of one's dollars will get there by donating directly. As I mentioned in a previous post, I can't even watch a Disney movie about animals without crying. When Hurricane Katrina struck last year, I blocked out any thought of the animals, just as I had done after 9/11. However, as much as I didn't want to know about their plight, I heard and saw snippets that deeply disturbed me. I decided that I couldn't be an ostrich anymore and even attempted to watch a PBS program on Katrina's Animal Rescue. I made it through about 6 minutes of the program and that was after I had turned the television off and on three times. I finally gave up. But, seeing that much made it impossible for me to just sit at home and cry about the animals. So, I went down to New Orleans (actually Tylertown, Mississippi) twice to volunteer with the rescued animals. (see any posts having to do with "Tylertown" under "archives"). I felt a kinship with Mark Hawthorne, who wrote an essay, "Confessions of a Sensitive Activist" in the current issue of Satya magazine. In the essay, he writes that his experience of seeing suffering animals in India was his first realization that his "sensitive nature" was going to make his desire to help tough going. And, as you can read in the "about me" section, my trips to India have had the same effect on me. And as much as I can't take visual images of animal cruelty or abuse, I read (ok, scan) such stories every day. The more I know, the more I'm spurred into doing something to help. And when the going gets tough, the antidote is Cute Overload;), which offers up a daily dose of cute pups, kitties, and all things adorable. Between the hilarious captions and the images, I am able to "re-set" my brain. The little guy pictured here comes from that site. AnimalSheltering.org's newsletter has a link to this report on the discussion on pit bulls at last week's Animal Care Expo in Dallas. The discussion was between Wayne Pacelle, president of HSUS, Donna Reynolds, executive director of BAD RAP (Bay Area Doglovers Responsible About Pit Bulls) and PETA president Ingrid Newkirk and presented the views and work of each organization. The report mentions some creative methods being carried out by BAD RAP. You can help support BAD RAP by purchasing their T-shirts adorned with the most adorble pit puppy. They are available at CafePress (click on banner I have below the mission statement in the left side bar of this page). Also, the matter of insurers charging homeowners more or simply rejecting them if there is a dog of a breed deemed "aggressive" living in the house is highlighted on the Massachusetts Best Friends Network site. And the editor has included the picture of my little orphan Annie from Tylertown. Last month, Firepaw released "An Analysis of Breed Discrimination of Domesticated Dogs Among Insurance Companies," which contains some good points about the faulty use of dog bite data used by insurance companies to support this discrimination, as well as factors, such as dogs being unneutered or chained, that are more reliable predictors of dog bites. Now that the number of animals has dwindled to fewer than one hundred in Tylertown, we are facing different challenges than earlier in the disaster relief effort. 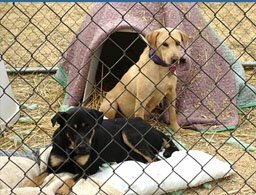 In a major revamp of operations, the camp at St. Francis Animal Sanctuary has been shifted from a rescue camp to a training center. http://network.bestfriends.org/hurricane/news/1683.html to Tylertown. There, trainers will be matched with dogs who need expert help. Many of the rescued dogs lack social and life skills; we want to give them every chance to be happy, and to get them ready for life in a home. Annie and Simon, two loving pit bulls at the Best Friends Animal Society hurricane relief center in Tylertown, Mississippi, (see posts from a few days back about Tylertown) have probably arrived at Spindletop Refuge, the pit bull rescue organization in Texas, by now. I will keep a look out on its website for them. According to its website, Spindletop has taken in over 200 Katrina dogs. Some of their income comes from selling cute pit-bull-related T-shirts and other products. Visit their shop by clicking the banner below. There are still dogs at Tylertown that need permanent homes. Here are photos of some that I met. There is information about these dogs and others on the Best Friends Network website. I returned from Tylertown last night. It was hard to leave my little orphan Annie. She and Simon, another project pit bull, and about 20 other pits will be going to a rescue group in Texas in the next couple of days. They are both such affectionate and well behaved dogs, I know they'll find permanent homes soon. Eagle was adopted from under my nose. Someone visiting Best Friends had her eye on him and when he and I were in the exercise pen she drove up and got him. Then they took off for Alabama. I spoiled both Annie and Eagle with tons of attention, playtime, walks, and treats; I can only hope their new people do the same. There is, of course, the much bigger issue of pit bulls nationwide. More and more, these basically good-natured dogs are being subjected to breed discrimination that does nothing to get at the underlying problems of animal abuse and neglect. These dogs are not the aggressors; they are the victims. And if, between us all, we show what can be done for a much-publicized collection of them, we'll be playing a critical role in turning things around for these innocent creatures. For more on this topic, see my post "Troublemakers: What pit bulls can teach us about profiling." Of course, Annie is a poster dog for how mushy and non-aggressive (unless you are a fluffy squeaky or soft rubber toy. Well, then it is pretty much guaranteed that you'll be disemboweled or shredded within minutes) pit bulls can be if not abused by humans. And I don't think drowning by kisses counts. The sun is out today, which is much better for everyone, dogs included. Celebration Station, the rescue operation in New Orleans, is closing shop in a few days, so some of the volunteers from here in Tylertown went there today. Which means I inherited Eagle, a beautiful chow mix with yellow eyes, as a second project dog. He is very sweet, and loves to play. He has long, dark brown fur that has all golden streaks in it as though it is professionaly done highlights. Yuck! There was a torrential downpour that started yesterday evening and lasted all night. It is still raining, which means the project dogs spend the day in the crates instead of in the yard. Poor Annie, my project pit, has so much energy I have already taken her on two long walks on the nature trail and it isn't even 9:30am yet. I will still take her to the exercise pen as she doesn't seem to mind the rain (or the puddles or the mud). It is wonderful to be able to spend all my time with one dog. I have taught Annie how to "stay"; she picked it up pretty quickly. She is very loving and loves to give kisses and just sit next to me and lean. When we are not with our project dogs, volunteers are taking apart the set-up here, preparing to turn it back over to the St. Francis shelter. Bertha, one of the St. Francis dogs, is in a pen downstairs from the loft where the volunteers are sleeping. She is recovering from a bite wound. She doesn't like being cooped up and spent all night howling, keeping us all awake and breaking our hearts with her pitiful pleas. I cooked Indian food for everyone last night. I had to make do with all kind of alternative ingredients as the local Wal-Mart or Piggley-Wiggley or wherever the shopping was done doesn't carry a huge assortment of exotic ingredients. The daal was a disaster, the channa masala came out pretty good, the rice and peas were horribly mushy, the gingered cauliflower was ok and the raita passed muster as well. I was glad that one of the other volunteers helped me or we would have been eating at midnight. This is my first full day back at the Best Friends Animal Society hurricane relief center in Tylertown, Mississippi. It is a whole different scene here now that there are much fewer dogs, no cats, and everything is winding down. When I was here in December volunteers were responsible for the daily care of the animals. We fed, gave water and cleaned out kennels. There was little time for socialization. Now, it is the opposite. The staff takes care of the dogs. Volunteers (there are about 10 at the moment) are assigned one or two project dogs. You have sole responsiblity of that dog, feeding, walking, exercising, and training. There is a "nature trail" in the woods for taking dogs on walks, a big, fenced in pen for 1 hour of exercise and a real-life room. This morning I took Annie, a brindle pit bull, on the nature trail, then for an hour in the exercise pen, where she ran around like a bat outta hell, then to the real-life room. There she investigated everything, destroyed a few toys and finally settled down for a nap while I read a book. The "project" dogs (there are about 6 -7 at a time) sleep in crates in the big room of the bunkhouse and spend all day out in the yard where they have Dogloos. After lunch today, one of the Best Friends staff members will be training us to train our dogs. Other changes include: the bunkhouse now has the kitchen and the dining area (the mess tent and dollar store are gone). There are fewer staff. The volunteers sleep in their own vehicle or tent or in the loft (it was pretty "cosy" last night with air mattresses up against each other). There are still dogs that are waiting to become "project" dogs and I believe about 100 dogs from Celebration Station in NOLA (the ones most recently to have come off the streets of NOLA) are arriving here next Tuesday. The plea on the Best Friends Animal Society website got to me and now I am headed back to volunteer at their hurricane relief center in Tylertown, Mississippi. There are fewer than 100 dogs left and they need one-on-one attention to help make them adoptable. I'll be there from February 22 to 28 and will be sure to post pictures of the pups when I get back. My posts about my previous trip to Tylertown start here (from there click left arrow above post). Tylertown animal shelter dogs, Yin and Yang, are now in a foster home with a couple who volunteered there the same time I was there. They've taken in these shy little girls and renamed them Thelma and Louise.